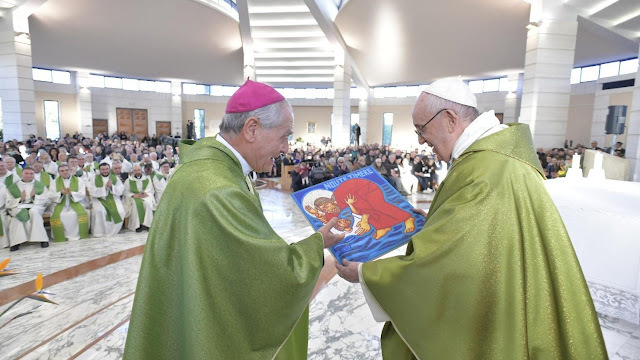 Pope Francis celebrates Mass at the Fraterna Domus Centre, in Sacrofano. “Free from fear”: that is the theme of a 3-day meeting organized by the Migrantes Foundation, Italian Caritas, and the Jesuit-run Astalli Center for Refugees. The meeting is at the Fraterna Domus, a Welcome and Retreat Center near the town of Sacrofano, about 20 kilometers outside Rome. The passage from the Book of Exodus presented to us the Israelites by the Red Sea, terrified by the fact that the Pharaoh’s army was following them and was about to reach them. Many thought: it would have been better to stay in Egypt and live as slaves rather than to die in the desert. However, Moses invites the people not to be afraid, because the Lord is with them. “Fear not, stand firm and see the salvation of the Lord, which He will work for you today” (Exodus 14:13). The long trip across the desert, necessary to reach the Promised Land, began with this great test. Israel is called to look beyond the adversities of the moment, to overcome its fear and to place full trust in the Lord’s salvific and mysterious action. In the page of Matthew’s Gospel (14:22-33), the disciples are disturbed and cry out with fear at the sight of the Master walking on the water, thinking that He is a ghost. On the boat, agitated by a strong wind, they are unable to recognize Jesus, but He reassures them: “Take heart, it is I; have no fear!” (v. 27). Peter, with a mixture of diffidence and enthusiasm, asks Jesus for a proof: “Bid me come to You on the water” (v. 28). Jesus calls him. Peter takes a few steps but then the violence of the wind makes him afraid again and he begins to sink. While caching him to save him, the Master rebukes him: ”O man of little faith, why did you doubt?” (v. 31). The Lord speaks to us today through these biblical episodes and He asks us to let Him free us from our fears. “Free from Fear” is precisely the theme chosen for your meeting. In face of the nastiness and ugliness of our time, we also, as the people of Israel, are tempted to abandon our dream of freedom. We experience legitimate fear in face of situations that seem to us to have no way out. And the human words of a leader or of a prophet aren’t enough to reassure us when we don’t succeed in feeling the presence of God and are unable to abandon ourselves to His Providence. So, we shut ourselves in on ourselves, in our fragile human securities, in the circle of loved persons, in our reassuring routine. And, in the end, we give up the trip to the Promised Land to return to Egypt’s slavery. This withdrawing into oneself, a sign of defeat, increases our fear of “others,” the unknown, the marginalized, the foreigners. And we see this particularly today in face of the arrival of migrants and refugees, who knock on our door in search of protection, safety, and a better future. Fear is legitimate, also because the preparation is lacking for this encounter. I said it last year, on the occasion of the World Day of Migrants and Refugees. Instead, we are called to overcome our fear and open ourselves to an encounter. And to do, this rational justifications and statistical calculations aren’t enough. Moses says to the people in face of the Red Sea, with a fierce enemy that urges them from behind: “Do not be afraid,” because the Lord does not abandon His people, but acts mysteriously in history to bring about his plan of salvation. Moses speaks thus because he trusts God. An encounter with another, then, is also an encounter with Christ. He Himself said so. It is He who knocks on our door hungry, thirsty, a stranger, naked, sick and imprisoned, asking to be met and assisted. And if we still have a doubt, behold His clear word: “Truly, I say to you, as you did it to one of the least of these my brethren, you did it to Me” (Matthew 25:40). In this sense, the Master’s encouragement to His disciples can also be understood: “Take heart, it is I; have no fear!” (Matthew 14:27). It is truly He, even if it’s hard for us to recognize Him: with torn clothes, dirty feet, a deformed face, a wounded body, unable to speak our language . . . Like Peter, we can also be tempted to put Jesus to the test, to ask Him for a sign. And, perhaps, after some hesitant steps towards Him, remain again victims of our fears. But the Lord does not abandon us! — even if we are men and women “of little faith,” Christ continues to stretch out His hand to save us and enable us to encounter Him, an encounter that saves us and restores to us the joy of being His disciples. If this is a valid key to read our history today, then we should begin to thank the one who gives us the occasion for this encounter, or the “others” that knock on our doors, offering us the possibility to overcome our fears to encounter, receive and assist Jesus in person. And, one who had the strength to let him/herself be freed from fear, who has the joy of this encounter is called today to proclaim it to all, openly, to help others to do the same, predisposing themselves to an encounter with Christ and His salvation. It is a grace that carries with it a mission, fruit of complete entrustment to the Lord, who is, for us, the only true certainty. Therefore, as individuals and as communities, we are called to make our own the prayer of the redeemed people: “The Lord is my strength and my song, and He has become my salvation” (Exodus 15:2).